The charming Old City’s colorful markets, beautiful elephants and golden temples set against mystic mountains and rivers make Chiang Mai unforgettable. Vast and verdant mountains, vibrant hill tribes and old-world charm set the scenery for Chiang Mai. Once the capital of Lanna Kingdom, this Thai city remains one of the most beloved destinations of the country. Each neighborhood of Chiang Mai has its own distinct personality. No two are alike, yet they harmoniously sit side by side – with adventures waiting to unfold. We arrived at Chiang Mai and checked into Le Meridien hotel, where we were welcomed by a sumptuous Thai dinner. We slept soundly that night but the city was wide awake. The hotel was on Changklan road, right at the heart of the old city of Chiang Mai. We were a stone’s throw away from Tha Pae Gate and Warorot Market. Downtown Chiang Mai is a place of bustling streets, shop houses, cafés and massage shops. Here, old meets new. 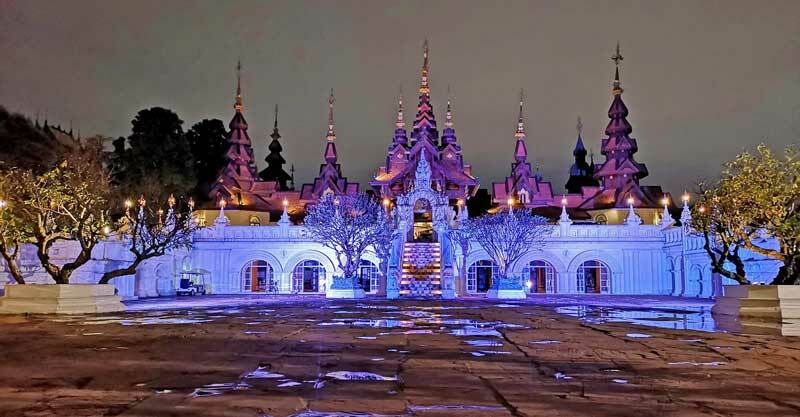 Millions of residents and visitors come and go yet Chiang Mai remains as it has been for decades. The heart of Chiang Mai continues to beat, flow and flourish. Fringing the Old City is the Night Bazaar, where one can find anything from elephant pants to woven bags and shurikens. Merchant stalls stretch as far as the eye can see, winding through the streets like streams. Shopping here was a different type of adventure — scouring through stores to find the perfect piece, then haggling down the prices. A stark contrast with the busy streets of the Night Market is the peaceful Riverside. Despite being the largest city in Northern Thailand, Chiang Mai’s riverside has retained a laid-back feel. Instead of five star hotels, the banks are lined with affordable eateries and live music bars frequented by tourists and locals alike. Here, you can get to know the city by walking along the banks of Mae Ping where you will see fishermen, street food vendors and the colorful fruit and textiles of the Warorot market. I woke up the next morning and opened my window to perfect weather, much cooler than the rest of Thailand, and sweeping views of Doi Suthep mountain. We were thrilled to find our very own local transportation waiting for us – open air jeepneys that would take us to the top of the mountain. It was a very relaxing ride and I quietly wished that the weather in Manila could be this cool. We explored the Hmong Hilltribe Village where we got lost in colorful shops filled with beautiful handicrafts like bags, hats and pants. The wild colors and patterns on all these products were a perfect reflection of the vibrant, happy culture they had up here. Entrance to Wat Phra That Doi Suthep Temple. 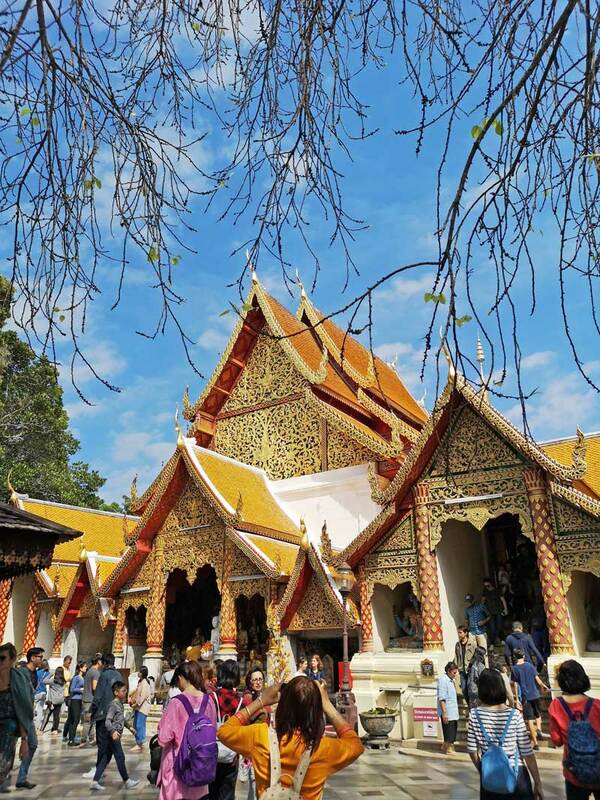 We then visited Wat Phra That Doi Suthep temple, one of the most holy Buddhist sites in Thailand. It was breathtaking, a masterpiece of gilded gold set against a fantastic natural backdrop. The temple was built on Doi Suthep, a regal mountain that towers over the city. For this reason, many consider the best view of Chiang Mai to be from the temple. Doi Suthep and the neighboring peaks Doi Pui and Doi Buakha, and the surrounding forests make up one of Thailand’s National Parks. The mountains are cloaked in thick forestry, with majestic waterfalls and diverse wildlife hidden throughout like secret treasures. Following our high altitude adventure, we visited MaeTaeng Elephant Park where we got up close to beautiful elephants. We were traveling with two adventurous toddlers, Pablo and Annika, who were looking forward to seeing the elephants more than anything else on the trip. It was such a treat for them to feed, hug and watch the incredible Asian elephants. 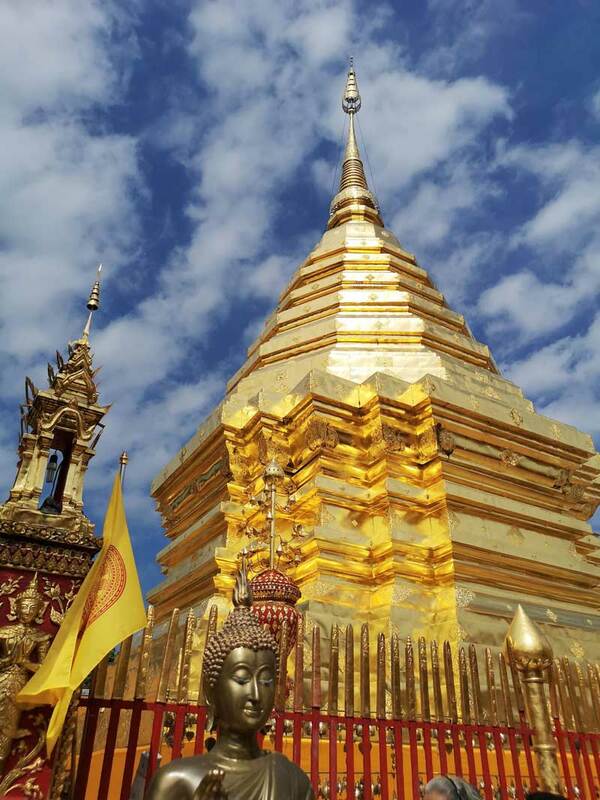 The golden stupa of Wat Phra That Doi Suthep Temple. 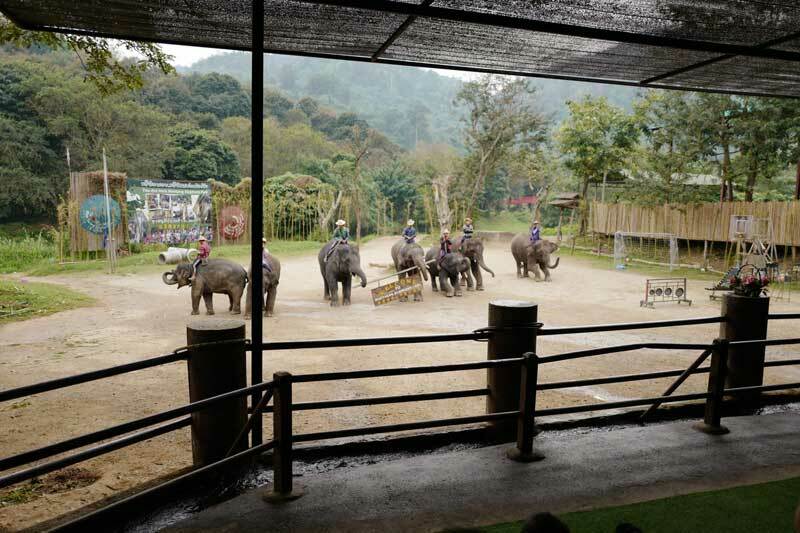 The MaeTang Elephant Park also hosts a free elephant clinic that treats sick and wounded elephants in the area. Before the park was opened in 1996, an elephant would have to board a truck for a three-hour journey to the Government Elephant hospital in Lampang. This caused a lot of additional stress for the elephants. To raise funds for the clinic, the park also sold elephant artwork. We were lucky enough to see two young, talented elephants, Suda and TW, create these masterpieces before our very eyes. We watched in amazement as they grasped the paintbrushes firmly with their trunks and artfully stroke paint onto the canvas. The resulting artworks were unbelievable. Suda painted two elephants playing underneath a tree in autumn while TW painted large trees with pink and yellow leaves. These could easily be mistaken for regular art from a gallery, not art painted by baby elephants. Our last activity in Chiang Mai was the highlight of our tour. We boarded the bus and traveled to a quaint suburb just outside the city center. We arrived at the gate of an old home, with beautiful landscaping and flowers all around the gate. You would think that this was just an ordinary residence but upon entering the gates, we were welcomed by rows of cooking stations, dozens of them, and fully equipped classroom-kitchens complete with their own army of chefs. This was Thai Farm Cooking School, where visitors could learn how to prepare authentic dishes like Tom Yum Soup, Curry and Pad Thai. The cooking school, owned by Sompon Nabnian, offers one-day beginner courses for hungry visitors like us, and longer, more advanced courses for foreigners looking to set up a Thai restaurant. The family that cooks together, eats together: Mike Constantino, Pablo Constantino, Christel Boncan-Constantino, Mark Dayrit, Matthew Dayrit, Alexandra Dayrit, author Christine Dayrit, Thai Farm Cooking School owner Sompon Nabnian, Samantha Dayrit, Yvonne Dayrit, Chef Garnet, Nikki Boncan-Buensalido, Mike Mina, Jaqui Boncan, Alex Tan, Carin Romualdez, Mylene Dayrit, Jason Buensalido, Vince Soliven, Michelle Soliven and Benny Soliven. Anything involving food was always a hit to our foodie family. Here, we had some of the best food of our entire trip. And we had been dining in some of the fanciest hotels in the city. Our cooking instructor chef Garnet was a fabulous teacher. She was an engaging educator, serious entertainer and Miss Universe fan, with a killer Catriona Gray slow-mo twirl impression. The food stole the show. 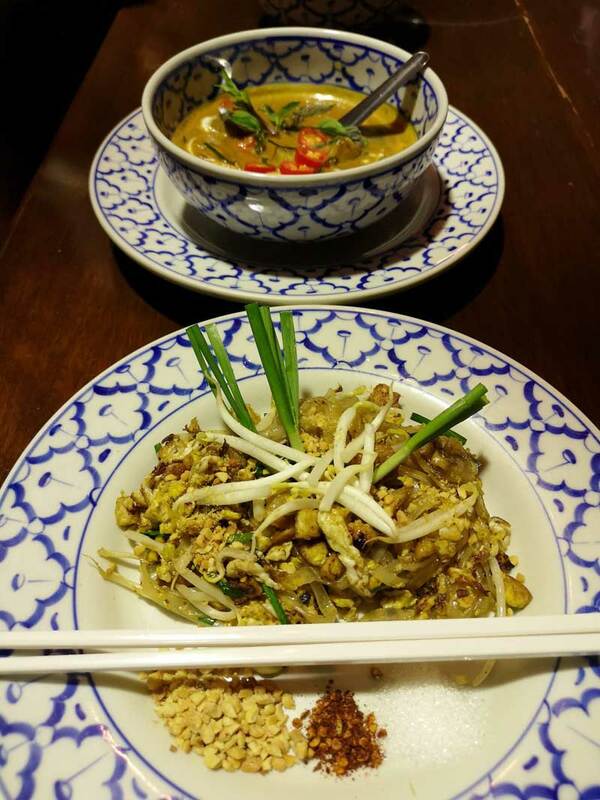 We learned the elements of Thai taste — it must be sweet, sour, salty, bitter and spicy. Then we proceeded to experience these through a gastronomic adventureFirst, we learned how to make fish cakes. Garnet demonstrated how to cut and mix the various ingredients to form the perfect patties. We then proceeded to our individual kitchen stations to make our own dishes. Elephants at MaeTang Elephant Camp prepare to enthrall the audience with their antics. Next, we tried our hand at making our own spicy-sour Tom Yum soup. The ingredients were fresh and simple — lemongrass, galangal and kaffir lime leaves lend their distinct flavors to the dish, which also has lots of Thai chilies, mushrooms, tomatoes, onion and chicken. 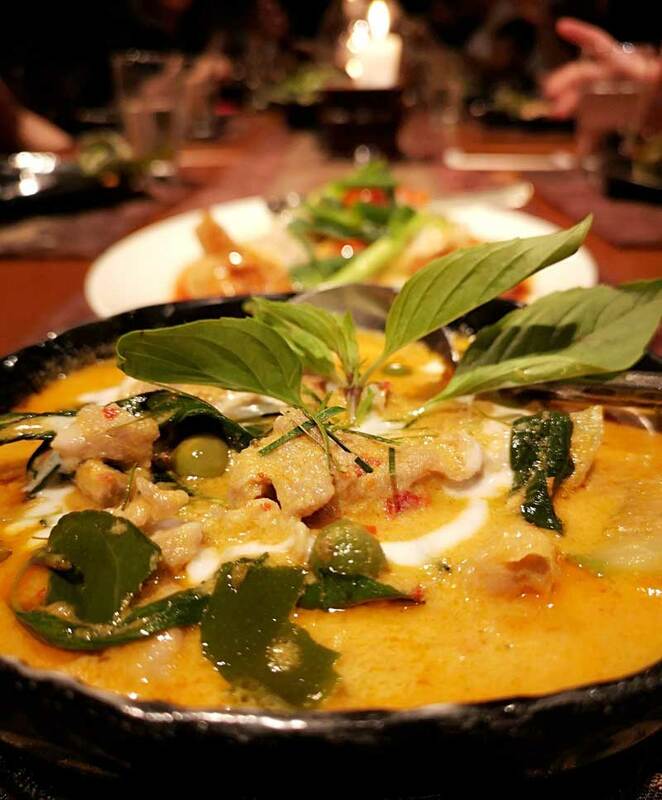 We then learned how to make Thai chicken curry with coconut cream and potatoes. The best part was that we each got to choose our level of chili. I grasped this opportunity to make mine really hot with six atomic Thai chilies in one little bowl. Chef Garnet taught us how to make our own Pad Thai, one of the most popular street food dishes. I was surprised how quickly it was made, stirring all the ingredients together until the dish was done in mere minutes. The fresh noodles and ingredients made this dish far superior to anything you could order in a restaurant. Dhara Devi Chiang Mai, one of my favorite places to stay in Chiang Mai. 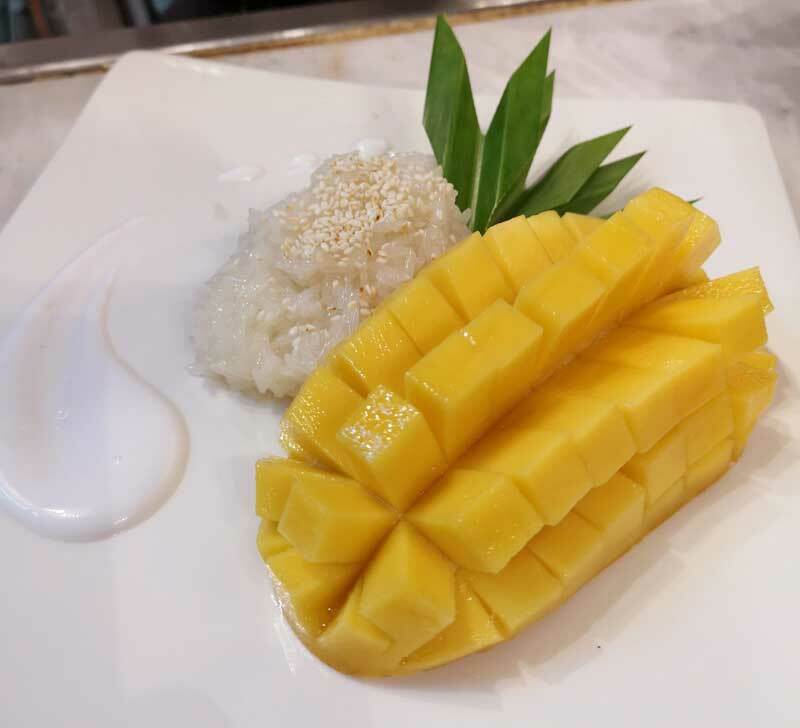 Finally, we watched chef Garnet make the piece de resistance — mango sticky rice. She stirred coconut milk and coconut cream into a huge pot of rice as our entire group cheered her on. She was astonished by our wild reaction to the sticky rice. I’m sure she must have thought we were crazy but we just really love our sticky rice. Let me tell you, it was the best I have ever tasted – sticky, chewy and super creamy with rich coconut flavor. It was the perfect way to end our sweet Chiang Mai trip. The cool mountain air, fantastic food and shopping will make Chiang Mai a destination to keep returning to over and over. The charming Old City, colorful markets, beautiful elephants and golden temples set against mystic mountains and rivers make this destination unforgettable. Memories of Chiang Mai will remain with me and my family forever.